Here is a window behind the scenes into the world of my students. Welcome to Bonnie Thrasher's Classroom Blog. Today was the second day this summer I spent about three hours in the classroom. I teach fifth grade ELA and United States History to aproximately 55 students each year. This will be the first year my students are in the middle school setting. So I strive to create a smooth transition blending the best parts of Elementary School and Middle School into one arena. View from the door. Anchor charts are prepared for each of those wall strips. They will be mounted as we cover that concept. View from the locker area. Teacher's desk is under the windows. Anchor charts will be posted in the empty wall spaces as we cover each concept. View from the back of the room. Anchor charts will fill the empty spaces as we cover each concept. Books organized in baskets by favorite authors and then alphabetically thereafter. (Dollar Tree for baskets, Office Depot ID badge holders and Home Depot Zip Ties. MUCH cheaper than Really Good Stuff) My photo wall of family and friends. Conference area. 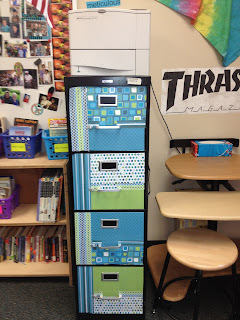 Filing cabinet upcycle using Mod Podge and scrapbook paper. Conference area with another up cycled filing cabinet. Daily extra papers go in the "rainbow" sorter. The view from the door. Vocab words and roots are above white board. Each table has a supply bin for colored pencils, crayons, glue, and pencils. The bins remain on the tables. Common area in front of the smart board for large group time on the floor. As students enter, they drop homework, notes, etc. off in the plastic trays. We have a large receptacle for recycling front center. Bulletin board will hold anchor chart pad as soon as the posters are finished. Thanks go to a friend for the idea of anchor charts to begin with as well as the idea of keeping them in a chart to flip as we need them! Notice no space is wasted. This is the teacher's conferencing/computing area. Peace be with you. Lava lamps in window in the peace corner. Teacher's desk faces student tables. My teaching partner, Steve, retired, and gifted his real wood desk and Mac desktop computer to me. Truly treasures that will stay with me until I retire. 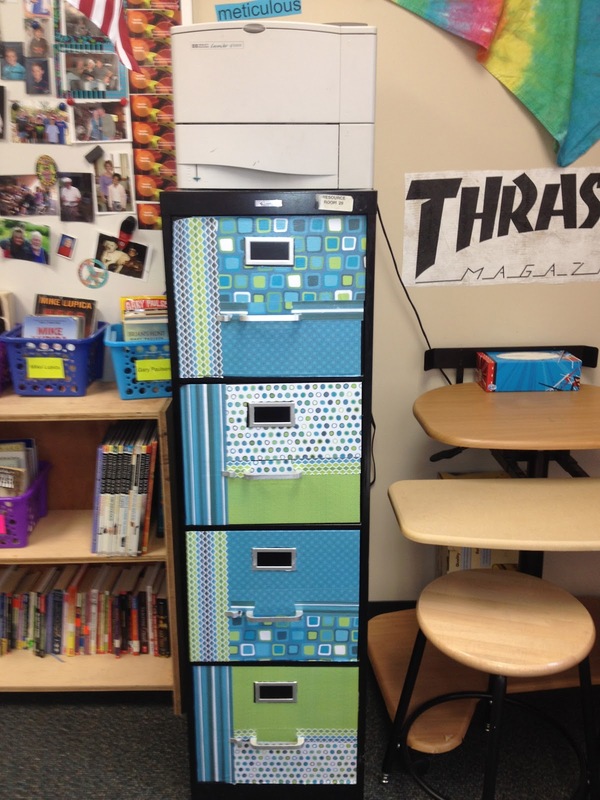 Our fifth graders have individual lockers (without locks) within each classroom. This is the view from the teacher's computing/conference area. View from the back corner. Door is in the top right corner. I LOVE LOVE LOVE PINTEREST!!!!!!!!! The designs for these anchor charts all came from Pinterest. I did NOT design them. 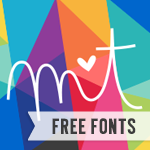 I found them by simply searching the keywords "Anchor Charts." We took the pins and then made them our own, personalizing them in some cases. There are more to come as time opens up to make them. As mentioned in the captions, I will mount each Anchor Chart as we cover that concept. I have the utmost respect for those with artistic talent who can create Anchor Charts with the students...unfortunately, I can't create them myself WITHOUT the students...so thanks be to my Kimmie for creating them for us! 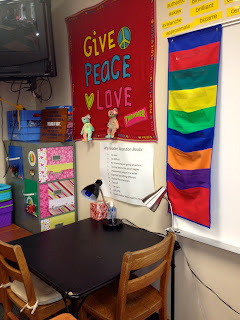 Thanks so much for visiting our classroom blog. Won't you tell us where you are from? We would love to hear from you about you, as well. Follow our updates by email! 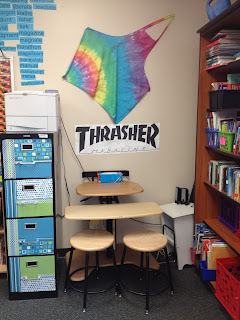 Subscribe To Thrasher's Fifth Grade Rock Stars! Peace seeking, fifth grade teacher, avid reader, dog lover, mother, wife, sister, aunt, God-mother, Grandmother who loves to laugh.